Seat Pitch MainCabin Select 38"
Rating: 8 out of 10 Reviewed from 69 flights with 534 photos. 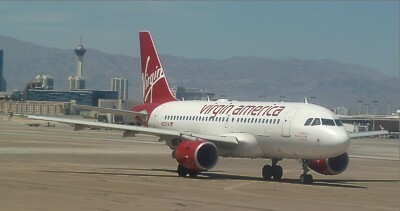 Virgin America is small, low-cost startup airline in the United States, operating mainly domestic routes. And yet in a way which has confounded its early critics, Virgin America reviews show it offers something genuinely unusual: the planes are new clean and modern: checkin generally works well, and on the whole the planes are on time. It is in the premium cabin that Virgin America excel: Virgin America First Class reviews are overwhelmingly positive, thanks to the lovely modern seats, excellent catering, and great inflight bar. Indeed, it is rare for Airreview to give such praise to an airline that is, in effect, just doing its job. 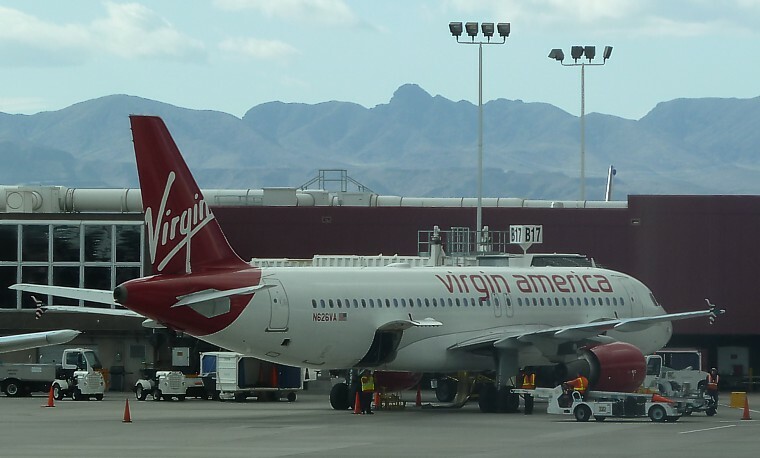 However compared to the usual motley crew of no-hopers that attempt to operate airlines in the US which make a misery of the business of flying, with woeful quality of service and planes, it is startling to find something different, and Virgin America reviews are certainly that. After all, while the USA may have been among the first countries to start commercial aviation, it has alas been among the last to update its airlines. It is often said that the US can't do airlines – and it certainly can't do First Class – Virgin America prove the point that there is a definite demand for quality in the skies, and that passengers will pay. 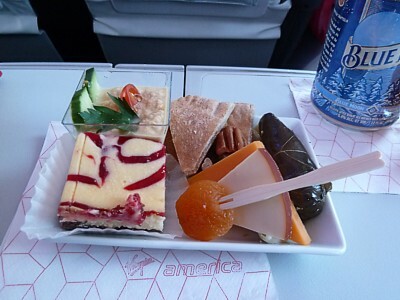 Read more about Virgin America First Class. Down the back of the bus, Virgin America economy reviews are still positive – just slightly less gushing. After all, here it is nothing but a low-cost airline, where you pay for your food, bags, and IFE. However the fact that seatback TV is on offer (at a price), as is Wifi, the food is a cut above the rest (ish: don't get your hopes up) and the way the seats aren't the usual plain grey wipe-clean plastic of most airlines in America, sets it apart. 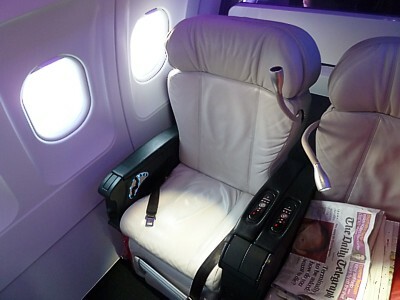 Read more about Virgin America Economy Seats. The airline has grown steadily since launch: it now flies to over 30 destinations from its hub in San Francisco, with over forty brand new Airbus planes. A Virgin America review now is quite different from when it launched. The airline has even started some international routes, although these haven't been a total success: loads are light to Mexico and Canada, where the brand is a virtual unknown. However the free inflight TV service is certainly lifting loads to US destinations Read more about Virgin America Seatback TV. There are still some let-downs with Virgin America. The frequent-flyer scheme is so-so, with a rather poor earn rate, and woeful availability for redemption. Alliances with other airlines are also miserly. It also doesn't give away upgrades like sweets: unlike other US airlines, which could explain the better quality you get up the front. And it is the front of the plane where the lovely creamy leather seats, flip out TV, and food even on the shortest of flights (no starvation if the flight is under 3 hours – unlike US Airways) comes to the fore. Buying upgrades on Virgin America is well worth it: they are cheap, and good value. 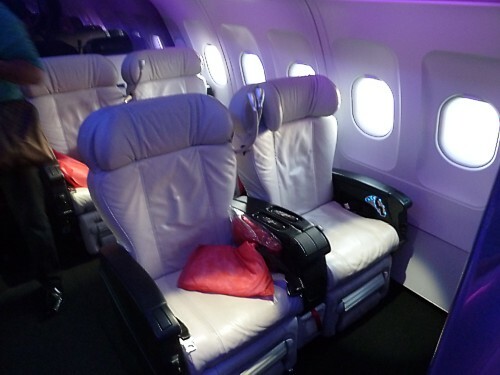 Read more about Virgin America Upgrades. First Class Cabin on Virgin America: good, init? 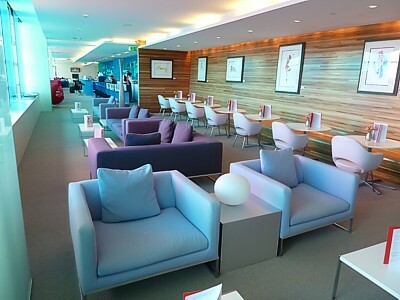 Alas First Class Virgin America reviews are let down, because there are no lounges as such: if you flight your way in you can get into the amazing Virgin Atlantic Clubhouse in three locations, but other than that you are down to buying day passes for other airline's lounges. Read more about Virgin America Lounges. On the whole, this new brazen upstart, that had to fight tooth and nail to launch, is giving the old legacy carriers a run for their money: it is no wonder that the grandfather airlines fought against giving it a licence for so long. While it is British designed, with a mission statement of offering low-fare, high-quality service for long-haul point-to-point service between major cities on the East and West Coasts, the airline has to be US owned to get around the restrictive protectionism in US aviation. Only 25% is owned by Virgin Atlantic. On the whole, Virgin America is a revelation: an airline that genuinely tries to make an effort. The young British upstart is showing the Americans just what is wrong with their airlines, and how. Note that all reviews and opinions on Virgin America food, service, seats, planes, upgrades, lounges, and the Frequent Flyer scheme is soley at my judgement. No legal liability is accepted if you take my advice.